The Indy is delivered every Friday to more than 10,000 Laguna Beach homes and to more than 125 strategic locations in town. With a total circulation of 60,000 newspapers every month with as estimated readership of 150,000*, the Indy has 3-5 times more exposure for your business than any of our competitors’ in print alone. At LagunaBeachIndy.com we receive at least two times the online traffic of our nearest competitor (with our Laguna Online Bundle). And, with a top listing in Google’s keyword search for Laguna Beach News, the LB Indy online is the best opportunity to get your brand or message out to our highly targeted audience. 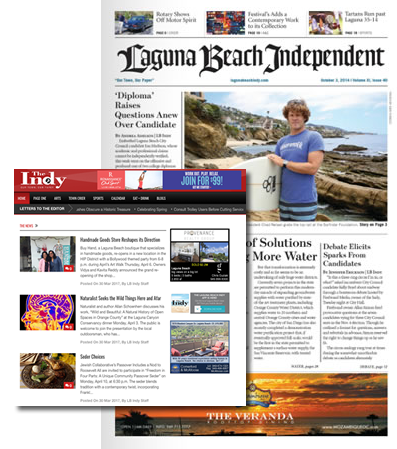 In addition, we offer great programs that combine our printed and online versions of the Laguna Beach Independent. There is no need to settle for a piece of the pie, we all know readers consume content differently, some in print, some online and some via mobile. The Firebrand Laguna Beach online bundle gives you everything.